In an average day, how many times do you depend on your mobile browser to search for something on the internet? As reported by The New York Times, in 2014, mobile browser usage was recorded by 134 million users—that’s 100 million more users than in 2010. This means people are depending on their mobile phones for web searches more. than. ever. In response to the soaring numbers of mobile web users, Google announced on April 21, 2015 the mobile-friendly algorithm update. This update will affect website search results on mobile devices (and mobile devices only). As web users shift to using their mobile devices for internet browsing, website owners and developers must adapt their websites to be easily viewable on smaller screens like tablets and smartphones. A mobile friendly website is easy to use and allows for maximum viewing on smartphone and tablet screens. D) Hidden Information: Not all info that is on the desktop version of a website needs to be on the mobile version—just the essentials needed for a visitor to take action. What Does the Update Mean for Websites and Mobile Browsing? Essentially, if your website is not mobile friendly, your site rankings are going to be negatively impacted and pushed to a lower page ranking than similar sites that do comply with Google’s mobile-friendliness algorithm. The addition of the mobile-friendly algorithm means that now, Googlebots will scan for how mobile-friendly your site is. Although Google’s exact ranking algorithm is kept under wraps, we do know this update will add into the already many factors that determine where a website lands in Google search results. According to our SEO expert friends at Organik SEO, to determine the legitimacy of your website, Googlebots frequently crawl code, scanning keyword density, indexing, active and inactive links, unique content, and more. Determining if your website is mobile friendly is just one more way Google is making the internet search experience easier and more legitimate for users worldwide. If you are thinking about building a new website or redesigning your current website, make sure your web agency is familiar with building mobile-responsive sites. Here at Shovel Creative, there are no ifs, ands or buts—you’re site will be built mobile-friendly, and we’ve been implementing this technique for the last two years. To see if your website meets the mobile friendly requirements, use Google’s Mobile-Friendly Test. Keep in mind web users have millions of choices at their disposal when browsing the web. An out of date site is an out of date company. The internet and its users are only getting savvier—make sure your website is ahead of the game and mobile friendly! Lauren is the Project Manager at Shovel Creative. She has been managing teams and projects for 4+ years and has an innate ability to communicate effectively as well as multi-task. Lauren's optimistic personality combined with keen leadership skills allow her to enjoy the hustle and bustle of time management. 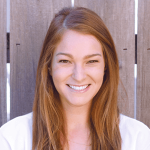 Lauren graduated from UC Santa Barbara in 2012, majoring in Communication and Sociology. In her free time, Lauren enjoys getting her sweat on at Orange Theory Fitness, weekend adventures with her husband and friends, and the scrumptious combination of wine and cheese.